Naushad's contribution to the Indian music cannot be quantified. Figures and words may fall miserably short of portrayal of his true genius. Naushad was a phenomenon; someone, who not only harmonized the Indian classical music into filmy style, but was an important part of the movement that has made music an indistinguishable feature of Hindi movies. Naushad Ali was born in the culturally important city of Lucknow. He got training in music from Ustad Ghurbat Ali, Ustad Yusuf Ali, and Ustad Babban Saheb. In 1930s, Naushad moved to Mumbai, where in the beginning, he struggled very hard to find a foot-hold. Later, he picked up a job in an orchestra. Before playing a second fiddle in many movies, he gave musical score to Prem Nagar (1940) independently. However, Sharda (1942) gave him much needed recognition. In 1940s, he gave music to many films that included Shahjehan (1946), Dard (1947), Dillagi (1949), Dulari (1949), Anmol Ghadi (1946), Elaan (1947), and Andaaz (1949). Naushad Ali s some of the best works like music of Baiju Bawra (1952) and Mughal-e-Azaam (1960) were steeped heavily in classical music. Mother India (1957), Mughal-e-Azam (1960), Ganga Jamuna (1961) and Mere Mehboob (1963) are some of the other films, whose music was created by Naushad. Pakeezah (1972) was the last great flick that carries the unmistakable Naushad stamp on its musical notes. However, Akbar Khan's Taj Mahal: An Eternal Love Story (2005) became the last movie of his illustrious career. Naushad would always be remembered for the fusion of Indian and Western instruments. Naushad was the pioneer of sound mixing and the separate recording of voice and music tracks in playback singing. He was equally fond of the sitar and the flute; the mandolin and clarinet. In an interview, he had said: "In my 62 years in the film industry, I composed music for 66 films we used to agonise over every tune and phrase in music, spend sleepless nights over a song, and work on it until it was perfected. And I am still looking for perfection." No other words can succinctly spell the creations and quest of Naushad. In 1981, Naushad was awarded the Dadasaheb Phalke Award for his lifetime contribution to Indian cinema. Naushad till his end was a vociferous critic of vulgarisation of music. 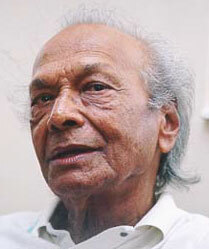 At whatever forum he could speak, Naushad condemned the pop and remix versions of old masterpieces in no unequivocal terms. In a career spanning over more than six decades, Naushad composed for just 75 films (out of that 65 were Hindi films) but then he was always regarded as the choosiest composer. Taking days to finalize one tune, he was also regarded as the slowest! As the pace of life went on quickening with each passing decade, such perfectionist attitude might have slowly made him redundant, but that very steadfast attitude also helped him compose many a masterpiece. Beginning his career as an assistant for music directors like Mushtaq Hussain Khan, Khemchand Prakash and Manohar Khanna, a young Naushad composed his first independent movie-score for Prem Nagar in 1940. In the initial years, he relied more on simple yet catchy rhythmic melodies. Listening to scores like Rattan (1943), Shah Jehan (1946) and Anmol Ghadi (1946) this simplistic popular appeal of tunes like Ankhiya Milake Jiya Bharmake, Ghum Diye Mustakil and Jawan Hai Mohabbat is well evident. 1952-film Baiju Bawra marked watershed in his career. From then on he consciously decided to work within the framework of Indian classical and folk-music. Thus he created many milestone raga- based songs like Man Tarpat Hari Darshan Ko (Raga- Malkauns), Madhuban Mein Radhika Naache Re (Raga- Hameer), Mohe Panghat Pe (Raga- Gara) and Mohe Bhool Gaye Sawariya (Raga- Bhairav) and also some brilliant folk-songs like Nain Lad Jai Hain and Dukh Bhare Din Beete Re Bhaiya. This total reliance on indigenous Indian music was Naushad’s strength and later sadly it also proved to be his limitation. * Naushad Ali (Dec.25, 1919 – May 5, 2006). * A school-dropout and a runaway entrant into film-music industry, Naushad gave first breaks to many popular singers like Mohammed Rafi, Suraiya, Uma Devi (Tuntun) and Mahendra Kapoor. He also groomed Lata Mangeshkar in her early years. * Many legendary Indian classical singers sang for his film-songs, notable amongst them being Pt. D.V. Paluskar and Ustad Amir Khan singing Aaj Gawat Man Mero in Baiju Bawra and Bade Ghulam Ali Khan singing Prem Jogan Banke and Shubh Din Aayo in Mughal-e-Azam. * He is credited for introducing modern recording techniques and for making background music an important integral part of films.